Kingston announced SandForce-based HyperX solid state disks, they are available in 120GB and 240GB editions for $269.99 and $519.99, respectively. Bundles with an upgrade kit are also available for $284.99 and $539.99, respectively. 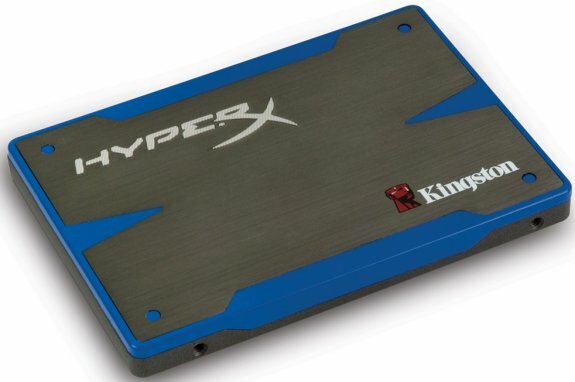 Kingston Digital, Inc., the Flash memory affiliate of Kingston Technology Company, Inc., the independent world leader in memory products, today announced it is shipping the HyperX® SSD, its first SATA Rev. 3.0 6Gb/s solid-state drive. The Kingston® HyperX SSD features the latest SandForce® controller and is designed for enthusiasts, gamers and performance users. 120GB and 240GB capacities*. Ships as a standalone SSD (includes HyperX branded 2.5" to 3.5" desktop mounting plate); or as a bundle with the HyperX Upgrade Kit for easy installation (includes Acronis® True Image™ HD migration software, desktop mounting plate, external drive bay, multi-head screwdriver, SATA data cable. Incredible sequential read/write throughputs of 555 / 510MB/s. SandForce SF-2281 controller featuring SATA Rev 3.0 (6GB/s). Max 4KB random read/write of 95,000 / 70,000 IOPS (120GB). Premium Intel 25nm Compute NAND (P/E 5K).